To say I am overwhelmed would be an understatement, thank you to whomever nominated me. Can I just say Wow and Thank you again. Stuff Your Stocking Christmas Blog Hop! It’s the Stuff Your Stocking Christmas Blog Hop! Join 193 authors in an awesome tour for prizes, giveaways, and much more from December 16th-18th. My name is Lynda Kaye Frazier and I write Suspense Romances. 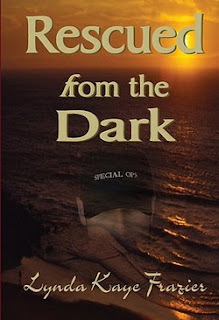 I’ve finished my first book, Rescued from the Dark, and I’m half way through my second. Yet to be published, but hopeful. A little background on the story. I am Morgan Kearns; former journalist, current author, and mother of four children to keep things interesting. I write contemporary and paranormal romance. My second novel, IN IT TO WIN IT, is the story of Sportscaster Jane Alexander and Baseball Bad-Boy Grayson Pierce. Tabloids love Grayson, and I’ve gotta admit I’m pretty fond of him myself. MK: *shakes his huge hand* Hey, Grayson, it’s really good to see you. Grayson: It’s great to see you, too, Morgan. How are things? You torturing Xavier yet? MK: Torturing? Is that what you think I do? Grayson: *laughs* Hell, yeah. You’re pretty sadistic. MK: *rolls eyes* It’s a good thing you’re story’s already done. Grayson: Seriously, you’re writing his story, right? MK: I am. He’s an interesting guy. Grayson: *nods* He needs a good woman who’ll love that chip off his shoulder. Do you know who she is yet. MK: Of course. You know her, too. MK: *holds up hand* Before you ask; no, I won’t tell you who she is.